Many people told me they were inspired by My Travel Reflections on 2013, when I described trips I had taken, month by month, during the past year. It got me thinking that we all have places we’ve been meaning to visit somewhere, often locally, but for some reason or another, that trip has never happened. Maybe it’s slipped our minds, or the next time we’ve been in the area we’ve been too busy to visit or had visitors with us. I’m not just talking about trips to other continents, countries or even regions. A local trip can be just as exciting. How about the little museum that people keep mentioning? Or the park you keep forgetting to take your picnic to? Next time you think of that place you’ve been meaning to go to – get out a pen and paper, make a list and resolve to go and visit them in 2014. 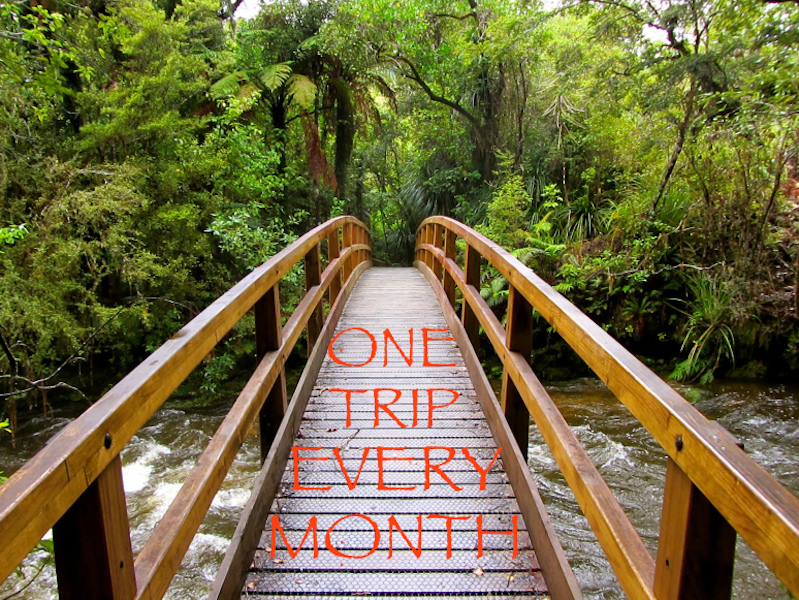 How about we make the effort to take ONE TRIP EVERY MONTH and then tell each other all about it? This entry was tagged Europe, inspiration, lifestyle, One trip EVERY month, One trip EVERY month Challenge, travel. Bookmark the permalink. It’s wonderful meeting up with other bloggers, isn’t it? Awww it’s a shame that Yuseke’s smile was so fleeting! I never knew about Ladybird Johnson’s connection to wildflowers. Don’t suppose the 2nd installment counts, as it’s the same trip – will have to do another. Just wondering whether the photo challenge has been replaced? Looks like you had fun, Rachel. I LOVE Cordoba! Lovely photographs and thanks for sharing your trip with us, Amy. WOW! The longhorn cattle are pretty impressive, aren’t they? I had no idea that the cavalry were still in existence – I thought they were just in the old films, riding in to save everyone!! Sounds like a pretty impressive day and a wonderful way to enjoy the traditions and heritage. I’m up for this, starting this month. Weather permitting, I’m off on a little trip tomorrow! Hope the weather’s good for you. Marianne, thank you so much – it’s only to get my head around it. I suppose it’s only trips we do this year???? Or!!!! Marianne … thanks, I thought it was trips during this year. Great challenge. Have to start thinking. Marianne, done my first post … will be posted this week. About my weekend in Gothenburg – I think it’s a great challenge. Yaay! Look forward to reading all about it! I love this idea. No more procrastinating! I’m all in! Thanks Amy – see you soon! Interesting new challenge! Go where you have dreamed to go, near or far, then share in words and pictures! Excellent idea! Is it OK if I join in next month? It will be fun reading about all new trips! That’s pretty much how I live my life, Marianne 🙂 Will you still be doing CBBH? Look at this Marianne…I made it. Went somewhere new…in Katikati…of course this month, and thought it was a good idea to share it with you !!! Off to see The Kiddywinkles tomorrow in Auckland, then on Sunday…the A&P Show. Woohoo !!!!! Avocado and Wine Festival – how wonderful! Looks like everyone had lots of fun! I’ll be thinking of you on Sunday – wow, one whole year since I was with you at the A&P Show! Time flies! Hahaha … why thank you, Madam! Good idea… I’ll see what I can do. For the first half of the year, we have quite a bit happening involving trips away… I just have to come to terms with my smartphone camera not being as good as the previous… I must get over it soon… or go back to the point & click, and try to emulate your wonderful efforts. Great idea, Marianne. If one just has to go back to a place previously visited, does that count? Sure, Sylvia. Any and all trips count – just trying to encourage people to get out and about by visiting places they’ve been meaning to get to. Sorry I haven’t commented sooner, Sophia – I’m having such trouble with my internet connection these days. It’s driving me mad!! I totally agree – this is the most magnificent photographic post EVER!!! What a FUN place Pretville is 🙂 I’m so glad you shared your trip with us. Hopefully others will be encouraged to visit now you have given them such inspiration. I love this idea! I’m sharing this post on all social media now! OOHHH … I’m sure you’ll make a trip SOMEWHERE before September, Dianne. Near or far, it’s still a trip and all the more exciting if it’s a first visit. That’s the whole point of the new challenge – to get everyone thinking of a place to go. Thanks for your comment, Dianne. Much appreciated. It’s a lovely idea Marianne – a great way to get out and about in my new home. Count me in! This is an excellent challenge…just to be sure I’ve got it straight, we can define trip as someplace we’ve been meaining to visit locally and then FINALLY got there? I’m really looking forward to reading everyone’s submissions! What a wonderful idea, Marianne. I have never participated in challenges before, but his I just might do. Yes! There’s at least one museum I’ve been wanting to go to. that counts as a trip yes? Have to think of other places to go meanwhile….great idea! Yes, of course – that’s exactly the kind of thing I’m talking about – especially if it’s somewhere you’ve kept meaning to go and put it off. ha ha, toddle indeed 😉 so, will you be creating a new post each month for these like your other challenge? so, for this one, report on a trip we made in January? and so on…yes? That’s an interesting trip on the ferry to Eastbourne, and one didn’t know about, but which I shall take next time I’m in New Zealand (hopefully this time next year). Thanks for sharing it – and the hokey pokey ice-cream! 1) I’m technologically “challenged” and have no idea how to go about getting your Challenge logo! 2) My blog is about the super new vocab I learn, so on each trip I have to keep my ears open for fabulous Spanish words! OK, as far as posting the Challenge logo, what you have to do is download the small logo to your computer and then upload it to your post (or sidebar) as you would with any photo you post. Look forward to hearing about your trips and learning some new Spanish words too! Yes, good idea I can do this, thanks for the challenge. I take local trips at least every month so I’ll join in! That’s great, Gilly – welcome! Actually I thought I might do some local travel this year. I have never been to Leeds, Manchester or Newcastle and there is a good train service from Grimsby which means they can be done in a day! Ha ha! I’m the first to ‘like’ this. And I do. I like this idea – haven’t seen it before, and I wouldn’t have thought of it myself. Thanks for the idea.